I can't believe I haven't written in over a month so sorry about that, but I do have a great excuse I was really busy getting Creepie Ellie for her launch date. 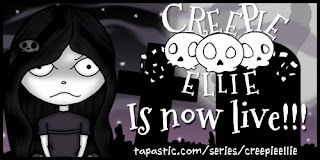 Which brings me to this, finally after 5 months of preparation Creepie Ellie comic is now live. That is right no more waiting. You can check it out at tapastic by clicking that banner. I haven't got the site up yet but that will happen next week since it is going to be a week behind tapastic but at least if you don't like tapastic or want more info on Ellie etc you can go to the main site when it is up. I am expected to go into the family business when it is my time, which to most people, that is fine. Though, when your father is Death himself, it can be a little grim. This is my story!! !